Joseph A. Puglisi has been a Chief Information Officer for the past fifteen years in the Insurance and the Construction industry. Mr. Puglisi is currently Vice President and CIO for EMCOR Group Inc., the world's leading electrical and mechanical construction and facilities services provider. As Group CIO, Mr. Puglisi is responsible for strategy and direction for over 85 operating companies throughout the US, Canada and the UK. For several years prior to joining EMCOR, Mr. Puglisi served as Vice President and CIO at Chartwell Re, a major insurance and reinsurance company where he managed both technology and administration for the company. Before that, Mr. Puglisi was Corporate Director of IT for Lehrer McGover Bovis, one of the largest Construction Management firms in the world. There he advanced the use of technology from pockets of word processing and spreadsheets on disparate, disjointed computers to one unified systems structure headquarters (NY) and all regional offices. The standards were later adopted by the parent in London and imposed on the other Bovis companies in the US and around the globe. Mr. Puglisi started his business career as a partner in a small consulting company for over 14 years with broad range of responsibilities from cold calls, through presentation, contract negotiation and close, product development, installation and training, support and consulting support. Mr. Puglisi has a BS and MBA from the Stern School of Business at NYU where he has served as Adjunct Professor in Information Systems at the Graduate level. 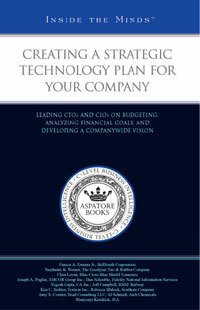 Mr. Puglisi has made contributions to a book, "Creating a Strategic Plan For Your Company", September, 2006 by Aspatore, Inc. Creating a Strategic Plan For Your Company is a collection ideas, thoughts and experience of senior IT managers from several of today's leading corporations. Topics range from budgeting and financial goals to developing companywide vision. Mr. Puglisi's contribution deals with how you move IT into the limelight. Beginning with getting your house in order, Puglisi recites some lessons learned and success stories from his long and varied career experience. Go to www.aspatore.com for ordering information.